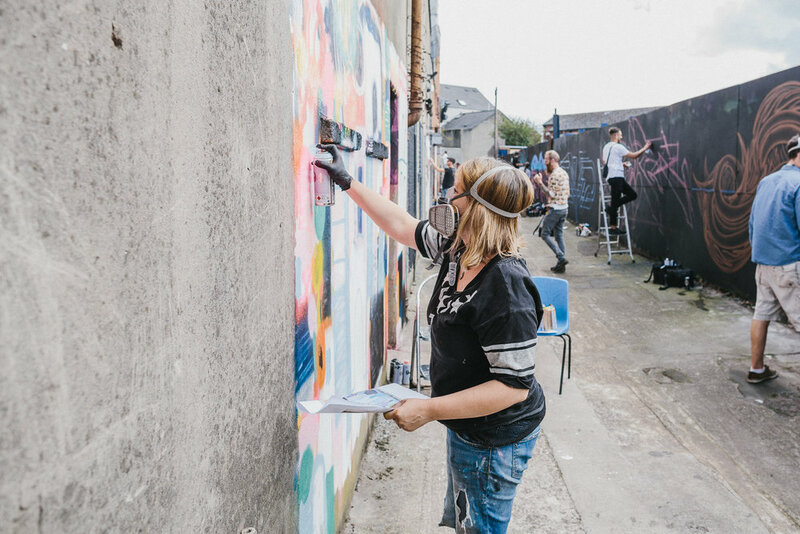 This year's headliners Nomad Clan, Dan Kitchener and Irony are joined by KVLR, Friz, JMK, Visual Waste, Emic, Verz, Rob Hilkin, Conor McClure, DMC, Tweet, Glen Molloy, Leo Boyd, Jess Tobin, Faigy, Caoilfhionn, Hanton, Lisa Murphy, The Drif (New York), KinMX (Mexico), Iljin, Marka Mix (Southy Africa), Aches, Emma Blake, Artista, Sophie Robson, Voms, ADW, Rask, Cheba, Sil, Le Bas, Easi, Noys, FGB, Esther O’Kelly and Art by Eoin. 4-8pm Live Painting across the Cathedral Quarter. Hear the stories and inspiration behind some of the artists painting at this years festival.